LABOUR LAWS IN INDIA- WHAT ARE YOUR CHALLENGES? 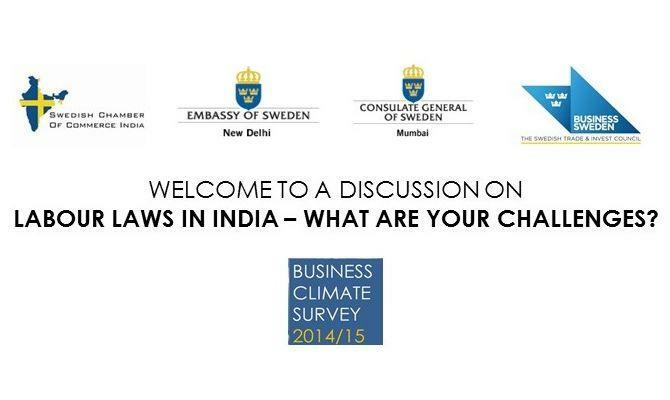 The Business Climate Survey 2014/15 conducted within the Swedish Business Community in India high-lights labour laws as an area of challenge for companies. Please join us on November 19, 3:30-05:00 pm in Pune, to discuss your experiences and challenges in relation to this topic. Based on earlier meetings with some Swedish companies in India, the Embassy of Sweden would like to share the main findings from these discussions and engage in a dialogue with Swedish companies in Pune on the same. The purpose is also to find out how Team Sweden (Embassy, SCCI and Business Sweden) can support Swedish companies in India in the area of labor market issues. Presenter is Ms. Yasmin Zaveri-Roy, Senior National Advisor from the Embassy of Sweden in New Delhi. This event is jointly organized by the Swedish Chamber of Commerce in India, the Embassy of Sweden, the Consulate General of Sweden in Mumbai and Business Sweden. This event is open only for Swedish company representatives only.